Erin Henderson says it has been "awesome" playing for Leslie Frazier, but Frazier feels his job status was a distraction for players last week. 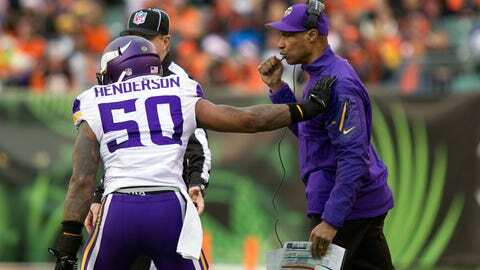 EDEN PRAIRIE, Minn. — Feeling his team had been distracted by rumors of his job status, Minnesota Vikings coach Leslie Frazier addressed the team Tuesday morning, trying to put the focus solely on the season’s final game Sunday at home against the Detroit Lions. "It’s like the elephant in the room," Frazier said Tuesday. "I just felt like we needed to get that addressed. Looking back at it, probably should have dealt with it a week ago. Don’t want those guys to be distracted. I want them focused on the opponent. I felt like we got a little distracted last week and I want to make sure that we’re all focused on one thing and that’s winning this game against Detroit." Minnesota had four turnovers by quarterback Matt Cassel, gave up more than 40 points for the third time this season and allowed more than 400 yards for the 10th time in 15 games in a 42-14 loss at Cincinnati on Sunday, which only further clouded Frazier’s future as the Vikings’ coach. Frazier said he sensed distraction within the team during the week leading up to the game at Cincinnati. "Just my gut," Frazier said when asked why he felt the team was distracted. "But just making sure that we were all focused on Detroit and that’s what really matters." After losing seven of the first eight games this season, and giving up the lead in the final minute five times this season, Minnesota is 4-10-1 a season after a surprising playoff appearance last season. Including a franchise-tying worst 3-13 record in 2011, Frazier is 20-32-1 in three-plus years as the Vikings’ head coach after four years as the defensive coordinator. "It’s been awesome playing for him," linebacker Erin Henderson said. "He’s been like a father figure to us, one of those guys that you don’t want to let down. He’s not really going to come out there and yell and scream at you or anything else, but he’ll kind of give you that look; that look of disappointment that might be worse than getting yelled at or cussed at. "He’s a steady guy. He’s always going to be the same way, no matter what, no matter what the situation is or who the situation involves. He’s always going to be who he is and that’s something you’ve got to respect. I appreciate all the opportunities that he’s afforded to me." Frazier has one more year on his contract after the team exercised a little-known option in the offseason for an extra year on his original three-year deal. He said Monday he hasn’t spoken with general manager Rick Spielman or the team’s owners about his job. Minnesota had won two of its previous three games before the embarrassing loss Sunday to the playoff-bound Bengals, who are undefeated at home. The loss dropped the Vikings to 0-7-1 on the road, the third time in team history they finished without a road victory. The players said they didn’t feel Frazier’s job status was the "elephant in the room." "No, I don’t think so," linebacker Chad Greenway said. "Maybe from the perspective of answering questions and stuff like that for him, but for us it’s about it is what it is and we have jobs to fight for too, so we’re trying to do our jobs as well as we can." Henderson said Frazier’s meeting Tuesday wasn’t necessary for keeping the focus on Sunday’s game at Detroit, which is the final game in the history of the 31-year-old Metrodome. "That was just something that he wanted to do, something that he felt was necessary," Henderson said. "We just go out and play football. We control what we can control. And that’s something that’s very far from our hands and very far from view from us. So we’re just focus on Detroit and going out there and trying to get a win." Peterson not practicing: Frazier said running back Adrian Peterson, trying to recover from a sprained right foot and groin injury, wouldn’t practice on Tuesday, but might be able to practice later in the week. Backup Toby Gerhart didn’t practice Tuesday after re-straining a hamstring injury in last week’s game. Minnesota was practicing Tuesday this week, and taking off Wednesday in a change from its usual weekly routine. The team will return to practice Thursday. "We’re hoping to get one of those guys back on Thursday," Frazier said of Peterson and Gerhart. "We’ll learn a little bit about some of the other guys as we move forward." Frazier said the chances for Gerhart to be ready for Sunday are looking slim after he had the hamstring injury come on again. "We’ll see what happens on Thursday when we come back, but the fact that he aggravated it in that ballgame probably makes it a little bit tougher," Frazier said. Frazier was hopeful rookie cornerback Xavier Rhodes, who has missed two games with a sprained ankle, might be able to return to practice. "We’re planning on him practicing," Frazier said. "He went through the walkthrough and everything went fine so we’re expecting him to be practicing today."